I recently spent a weekend locked in an Indianapolis Hotel with 20 other libertarians from around the country. We were either appointed by the Libertarian National Committee or sent as delegates from our state parties to create a report of recommended changes to the Libertarian Party Platform to be submitted to the delegates at the upcoming national convention. Organized within the framework of Roberts Rules of Order and Parliamentary Procedure, we debated how libertarian principles, policy recommendations and marketing strategy should guide our party platform. While serious points of contention revolved around grammar, style and the use of oxford commas, there were many fierce debates that got to the heart of what libertarianism is and isn't, putting our very name on the line. I volunteered to be the representative for the Texas Libertarian Party not because I feel passionate about any particular planks I want to see changed in the current platform, but because I pretty much like it the way it is. I've previously written on the dilemma that many principled libertarians face, which is whether or not to vote or otherwise engage in the political process. The authors that contribute to the best-read libertarian website in the world seem to be almost unanimous in condemning political action, even within the LP. I'm of the opinion that as long as the Libertarian Party does not misrepresent their core message to appeal to the masses and truly deserves the name "the party of principle" then the majority of the arguments against joining and supporting the LP don't hold water. This gets to the heart of another topic on which I've written, whether the Libertarian Party should take a principled or a practical approach in the political process. This foundational decision has many implications that don't always fall down the anarchist vs. minarchist party line. What is the primary purpose of the Libertarian Party, to spread libertarianism or to get candidates elected? Who is our target audience, libertarians or non-libertarians? God help us, there are some that even disagree on what libertarianism is! Only when those questions are answered do you have the framework for creating a cohesive and consistent Libertarian Party Platform - and when the delegates and leaders of the party are sharply divided on these issues we are setting ourselves up for some interesting debates in June. George Orwell prophetically wrote on how language and the meaning of words can be used as a weapon in the political arena. If you are able to influence culture enough to change or confuse the meaning of words you can thereby narrow the spectrum of allowable opinion and guide the masses without them ever realizing it. One example of this phenomenon is the term liberal. Thomas Jefferson's liberalism aligned to small governments, free markets, and natural rights while today's liberal supports big government, economic regulations, and privileges granted by "society". Taking this lesson from history to heart, it is vitally important for the libertarian movement to not allow our brand to be misrepresented. Without assigning motives to people I don't know, there are some trying to expand the term libertarianism to include things with which it has no concern, thereby diluting the core message into meaninglessness and creating contradictions where there should be none. Quoting from a recent article by Laurence Vance on this very topic, "Libertarianism is a political philosophy concerned with the permissible use of force or violence." But that can be said of all forms of government, as government is defined as a monopoly on the use of violence, and therefore the type of government you have guides how violence may be legally used. Democracies adhere to majority rule, such that 51 people can vote to use violence against 49 others. A Monarch can use violence against any of his subjects with impunity. Under communist rule any individual can be aggressed upon if it benefits the commune in the eyes of the communist leadership. That is all libertarianism is about: when you can and cannot use violence or the threat of violence. Because of this limitation some criticize libertarianism for not being what it is not and has not ever been: a comprehensive moral philosophy. Libertarians are typically characterized as sexists, racists, bigots, homophobes and elitists because we do not believe in outlawing these types of behaviors. Libertarianism says what you must not do, not what you should do. We stand for the freedom of association, including the freedom not to associate. We stand for the freedom of speech, including unpopular speech. We stand for self-ownership, including the right to do things to your body that may be harmful. Because of our principled stance to always protect individual liberty, even when liberty is used in ways some may disagree with, we are painted as endorsing these vices. However, libertarians have a wide range of non-aggressive responses to vices. Unfortunately, in this day of omnipotent government there are only two options for any given behavior, it should either be forced or forbidden, both carrying the threat of being locked in a cage or worse for disobedience to the state. 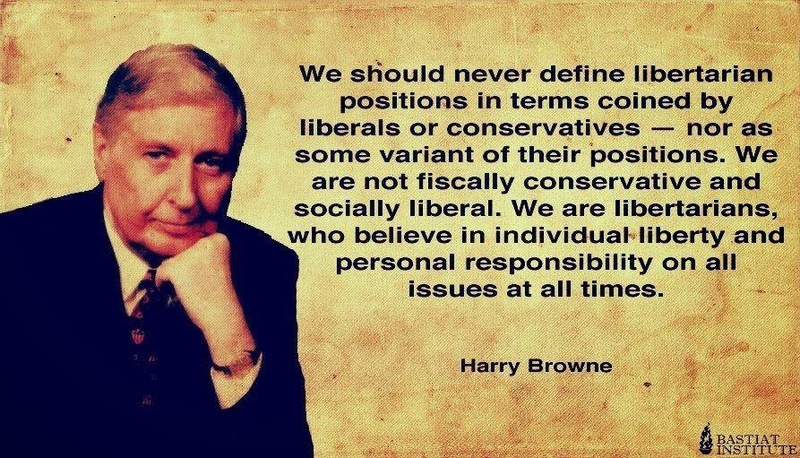 It is one thing to find this misunderstanding to be pervasive among the average voter, but it is far more serious and disappointing when people calling themselves libertarians display this same ignorance towards the most fundamental concepts of their professed ideology. Sometimes it may be from lack of knowledge but at other times it is a deliberate misrepresentation. 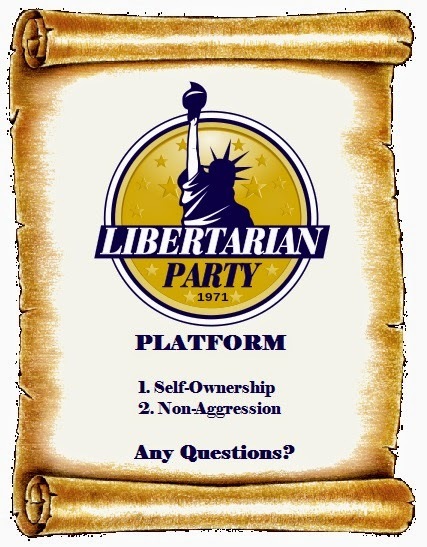 At the Libertarian Platform Committee meeting suggestions were made to add and remove language to our platform planks to make them more appealing to the voters. There is nothing wrong with being brief instead of wordy, using plain words instead of libertarian-insider words, and using proven salesmanship approaches - but only as long as you do not distort your message in the process. One misguided idea that came up several times was to add qualifying terms in reference to who could and could not exercise certain rights. For instance, plank 1.6 Self-Defense very boldly defends the right of individuals to own and use firearms in self-defense and correctly calls out our opposition to all laws that would infringe upon this right. This is as libertarian as it gets - the right to own property, including firearms, is only limited by the duty not to infringe on the equal rights of others and any action to pre-emptively violate this right is itself an aggressive, unjust, and criminal action. Despite my best protests the committee voted to recommend a change in the current language from "individual" to "peaceful adult". This might seem like a sensible substitution that doesn't materially change the plank, but let's explore the ramifications of this seemingly innocuous appeal to common-sense. When we say that a right can only be exercised by a "peaceful adult" or use any other qualification it ceases to be a right and becomes a privilege. The new language didn't say the use of firearms must be peaceful, that would be implied by the term "self-defense". It described the type of individual who may exercise this right without prior-restraint through law. Now we must define what is "peaceful" and what makes someone an "adult". We are a political party concerned with the use of violence, so when we qualify a right in our capacity as libertarians we are not strictly speaking of the criteria we would impose in our private lives. We're not simply saying, "it's a good idea for gun owners to have a history of being peaceful and mature enough to know the impacts of their decisions with firearms." We are saying that only "peaceful adults" may exercise the "right" to gun-ownership, and others will be violently prevented from doing so. When we beg the question of what is peaceful and don’t define it ourselves we are implying that government will define the answer - and today that answer is non-felons. When scholars report that the average person commits 3 felonies a day, tens of thousands of which are non-violent, we end up nullifying our entire plank with those two simple adjectives. But even if we narrow our lens to felons with a history of violence, I believe that once they are freed from their cages they regain their right to own firearms and use them in self-defense. In other words, I think that the current system whereby a mistake when you're 18 means you can't defend yourself or your family for the rest of your life is unjust and patently un-libertarian. When you don't defend the rights of the marginal groups of society you strip those rights from everyone. If this change is adopted it amounts to us saying that we defend the right of gun-ownership for some individuals, as long as the government says it's OK. That is hardly a stance worthy of the name "the party of principle". When all the libertarians in the LP understand the implications of our principles and are willing to defend them, even the unpopular ones, we still have some big questions to answer in the realm of tactics and strategy. How do we market ourselves? Who do we market to? What are our goals? These questions have very real impacts to how one constructs a party platform. I believe that our primary goal is to spread libertarianism. Unlike other libertarian groups that share this same goal, we explicitly use the political process, the political party, and candidates for political office as the channels for our message. Every voting season there are millions of dollars worth of free publicity in newspapers, radio, and television. Considering that libertarians are characterized for annoyingly pushing their message to unreceptive hosts at social gatherings, we must take advantage of every opportunity when we have an invitation to talk about libertarianism. Journalists and special interest groups will invite libertarian candidates to speak to them and explain what libertarianism is and how it would solve our problems - and the only cost for this unprecedented opportunity is the time to fill out some paper work! With our primary goal of spreading libertarianism and our means of the political process established our secondary goals naturally follow. First, we need brave souls willing to run for office. Candidates can spread libertarianism by speaking to voter groups, being interviewed by the press, and participating in debates. In order to magnify the candidate's impact libertarian activists can help with their time and money. This can take the form of block-walking a voting district, helping with a phone banking initiative, writing letters to the editor, or merely talking to friends and co-workers about why they are voting for the libertarian candidate when that question naturally arises. For those that are short on time to donate, money can be used to buy advertising, mailers, yard signs, voter lists, and automated calling services. Unfortunately, both time and money are needed in many states to collect signatures and fight lawsuits to get libertarians on the ballet, but this is worthwhile because it is a prerequisite to our means of engaging in the political process to achieve our goal of spreading libertarianism. 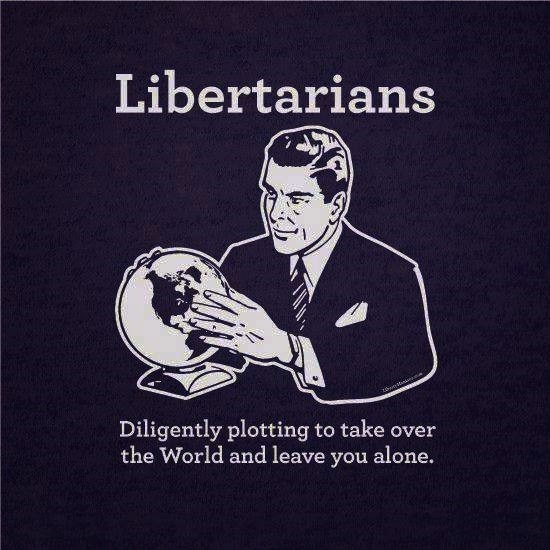 In order for the LP to do justice to the term libertarianism this prioritization of goals must be adhered to. Unfortunately, a sizable number disagree with this approach. During the Platform Committee meeting one member stated "I don't care about educating people, I want to get elected so I can make a difference." Another member explicitly stated that the #1 goal of the LP should be to get candidates elected and pointed to the Indiana LP's "purpose and principles" as a reference, which states, "The mission of the Libertarian Party is to move public policy in a libertarian direction by electing candidates of the Libertarian Party to public office." Let's consider the implication of this reversal of priority. If the primary mission is to get candidates elected then any secondary goals must necessarily align with the primary goal or be sacrificed, by definition. So if the voting population is not ready to accept the message of libertarianism, if a candidate who promotes a libertarian message cannot win a majority vote, then the candidate's message must be "softened" to increase the odds of electability. But now we find ourselves indistinguishable from candidates of the two major parties - power hungry office-seekers who have no core beliefs but will modify their positions at the drop of a hat based on the latest polls. Maybe that's a little harsh, but it is the logical implication of setting the primary goal as "winning". As the saying goes, if we sacrifice our message we are more likely to lose twice, first because we won't win the election and second because we won't get our message out. But let's suppose we do elect candidates with this "sneak attack" method. Assume we have candidates who will adhere to their libertarian principles once in office but will water down their message when electioneering in order to trick the majority into giving them their vote. In this scenario the elected closet-libertarians reveal their true intentions after taking office, after which they immediately roll back government excess and increase liberty in their district, in other words, "making a difference". Based on the prosperity, peace, and other social goods that libertarianism provides, the voters then reflect that libertarianism is pretty great after all and are converted based on the experience of libertarianism, rather than by rhetoric and logic in the abstract. In the best case scenario we can see this is a short term victory. If we gain libertarians that like the utilitarian benefits of liberty but do not understand how the principles of self-ownership and non-aggression are the logical and economic pre-requisites, then have we really created an ally that's in for the long haul? What happens when the opposing party promises more goodies? Without the foundational understanding and truly creating a change in thinking and culture the best we could hope for is a few years of material improvement before regressing back to our current predicament. But that thought experiment assumed something that would never happen in the first place. A "liberty friendly" message that avoids the logical consequences of libertarianism for reasons of political expediency will never win under the banner of the Libertarian Party. Wayne Alan Root was the most visible proponent of this "big tent" strategy, where he openly called for only appealing to disgruntled republicans and avoiding our beliefs that would not align with this voter block. I attended Freedom Summit in 2009 where Judge John Buttrick debated this strategy head-on and pointed out its flaws. Judge Buttrick's most compelling argument appealed to common sense and asked us to put ourselves in the position of a liberty-friendly disgruntled-republican. Given all the options for spending one's time and energy, in what vehicle will such a person get the greatest returns for their activism buck? Will they go to a party that fights to get more than 1% of the vote in a Presidential election and hasn't earned an electoral vote since 1972? Clearly not. They will join Ron Paul and work to reform the Republican Party from the inside. Making the primary goal of the LP to "get candidates elected" is a death-sentence for our party. Not only will it cause us to fail in what our mission should be, to spread our message and increase the number of libertarians, but it will also never be successful in getting candidates elected by misleading the public into giving us their vote. As Lew Rockwell pointed out in his essay what libertarianism is and isn't, "if we expect to trick people into becoming libertarians, we will fail." Instead of trying to appeal to the masses we should stick to our principles, even the unpopular ones. This leads me to a novel idea: the Libertarian Party should focus on libertarians. Some believe libertarianism should include things that don't pertain to the permissible use of violence but fall in the category of fairness and egalitarianism. A sizable number of LP leaders believe the primary goal of the Libertarian Party is to get candidates elected so we can pass bills and "get things done". Both of these beliefs directly impact how one approaches what the LP party platform should contain, how it should be written, and who it should cater to. For those that share my position about libertarianism and the Libertarian Party, I offer the following principles that drove my thought process when serving on the LP platform committee and will guide my voting at the convention this June. Platform planks should logically flow from self-ownership and non-aggression. Why do we oppose the war on drugs? For the same reason we oppose taxation. It's the same reason we support freedom of speech, the right to contract, and the right to associate: self-ownership and non-aggression. There are plenty of causes, beliefs, and opinions that libertarians hold in their private lives but if they do not pertain to the use of violence in society they should be left out of our platform. Yes, individual libertarians may believe that it is moral to donate to charity, offer fair wages, and operate without discrimination, but unless we are opposing government violence from forcing us to do these things we have nothing to say in our capacity as libertarians concerning what individuals should do in their private lives. Platform planks should speak to timeless principles, not to specific policies or bills. We are against aggression, and therefore theft, and therefore taxation. We are not for "the fair tax", the "50 payer tax", excise taxes, or other taxes that would be less bad than what we currently have. As individuals or even as candidates we might support these half-measures to ease our suffering. However, we'd support them not in our capacity as libertarians, but as victims of current aggression that we would like to be relieved of, if even partially. We are in the position of a concentration camp victim that would gladly take the opportunity to sign up for work under the supervision of a sympathetic guard instead of a psychopathic one known for his cruelty. In this way we are not confusing the libertarian message by claiming that we are for "low taxes" when libertarianism is logically opposed to all forms of taxation. Platform planks may be aligned with the Constitution, but that is not why we support them. We are not the Constitution Party, we are the Libertarian Party. It is one thing to say "Libertarians support the rights recognized by the Fourth Amendment", it is another to say that we support the Constitution unilaterally or to imply that we support a right because it is in the Constitution. We don't need a piece of paper to guide our decisions, we have something far more powerful. Abide by the Dallas Accord. Frankly, non-aggression and government are polar opposites. The only permissible "government" that would be logically consistent with libertarian principles is one where all services would be paid for voluntarily and any violence executed would be defensive in nature. Of course, one could argue that in that case you are no longer describing governments but private businesses that are in the defense and arbitration industry. It seems a fair compromise to ignore this bit of double-think in exchange for remaining silent on the need or "legitimate purpose" of governments and always allowing for an interpretation of no government without saying so explicitly. Not everyone is ready to go full-blown an-cap so we should welcome the minarchists by allowing for the fantasy of the non-coercive "government". At the same time, we should not turn away our most logically-consistent and principled demographic, the anarchists. Golden rule: don't make candidates oppose the platform. Some candidates might only support a bill that would repeal a tax completely, some might vote for one that would reduce taxation, but both operate under the same principle that taxation is inherently immoral and un-libertarian. Some candidates might rest easy with a night-watchman state and others may not be satisfied until we live in our anarcho-capitalist paradise, but both can agree on the maximum role of government, because technically, a maximum without a minimum can give us a role of nothing. The goal is to give libertarians a platform that teaches by example how our principles of self-ownership and non-aggression logically guide us to all of our policy positions, and from there give candidates the freedom to get more specific within the guidelines we've set. Because the principles of liberty are timeless, an ideal platform would be as relevant and powerful 100 years from now as today. The positions I've set forth would cause some to label me a "purist". While I proudly wear that badge of honor, there is unfortunately some truth to the negative connotation that comes with it. Many of the "purists" lack basic tact and social skills to such an extent that it seems they might actually enjoy arguing with people just for the sake of disagreeing. If talking to a democrat they'll talk about gun rights, if talking to a republican they'll bring up gay marriage. Instead of finding common ground and educating, they will latch on to the biggest point of contention and revel in being marginalized. It doesn't have to be this way. This is not a black or white issue. It is a false choice between upholding a pure and consistent libertarian message and adhering to basic social etiquette. We can utilize proven persuasion and marketing skills when speaking to the public without watering down our message and confusing our brand. Having spent two years as a door to door salesman, and currently working in the consulting field, I have a few suggestions that apply to all areas of sales, including selling the message of libertarianism. Instead of talking, listen. Try to do twice as much listening as talking. Then three times as much, then four. The harder this is for you, the more important it is to work on it. If your goal is truly to wake up minds and change people's perspective, you first need to make them feel understood before they will actually hear your feedback. Speak their language. In other words, be adaptive to their interests. It's perfectly alright to talk about "fiscally conservative" issues with republicans and "socially tolerant" issues with democrats. The opportunity to educate comes with first finding that common ground and using that as an opportunity to explain how the principles of self-ownership and non-aggression align with their beliefs. People hate to be sold, but they love to buy. This has a lot to do with listening instead of talking. Don’t push your ideas on people. You may be 100% correct, but if the other person isn't listening to you because they feel like they are being sold something against their will then what good does it do?. Ask questions, then listen to what the other person has to say. What do they think about a certain problem that they are passionate about? Why do they think it occurs? What do they think should be done about it? If the answer is "there should be a law against it" then the answer isn't to call them a statist. Ultimately this person has the same end goals as everyone else - peace, prosperity and a higher standard of living. When you find the opportunity to answer a question and explain how libertarian principles result in these social goods, you have created the condition where they might just want to buy what you have to sell. Ultimately, the biggest lesson I've learned in my activism career is that the only person I can educate is myself. Oftentimes when someone "wakes up" to the libertarian message they are so excited by this new world view that nothing seems more important than sharing this epiphany with everyone, all the time. This urge, while commendable, should be resisted. The first step is to educate yourself, not just on your pet issue that aligns with libertarianism, but on all of the hard cases too. Walter Block's Defending the Undefendable is a classic libertarian book that takes up this challenge head-on. Of course, Murray Rothbard's For a New Liberty and The Ethics of Liberty are must-reads for setting the foundation and exploring the full spectrum of libertarianism. When hard topics like environmental protection and child-labor comes up, we have the shoulders of intellectual giants at our disposal, and we would be foolish not to use them.